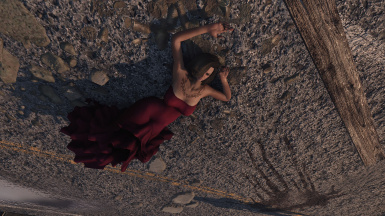 Bring the one dress with insane quality to fallout 4 from Skyrim. Add dress physics to the normal version, install on top of the main file. Choose one for your preference. This mod is an FO4 conversion of Gekkou1992's extremely high-quality Party Dress from Skyrim, it will replace the vanilla red dress in game. Both Normal and CherryPhysics version is included. 1. Download the original mod from here, you will need the main file only. 2. Extract the file, delete the SKSE folder and PartyDress.esp, repack the rest and install as normal. 3. Download and install my file, allow overwrite on anything if asked. 5. Optional, the Preset shows in the images is included in the file. You can use it or use your own preset, please note certain slider will break the dress such as Apple cheeks or center breasts, use with discretion. drmwayne, dress physics for the normal version. Ousnius, Bodyslide and Outfit Studio.